The late wife of a Los Angeles councilman was recognized Monday as the inspiration behind legislation that has resulted in tens of thousands of low-income, mostly Latina women having access to potentially life saving technology and breast cancer treatment. 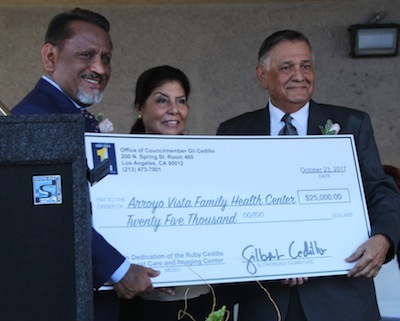 The Arroyo Vista Family Health Center in Highland Park on Monday formally dedicated and renamed its Breast Care and Imaging Center in honor of Ruby Cedillo, the wife of Councilman Gil Cedillo who died from breast cancer in 2002. October is Breast Cancer Awareness Month and the pink ribbons that have come to symbolize the fight against cancer were everywhere. The naming of the center after Ruby calls attention to the countless women who have lost their lives to the disease, and the advances in treatment and early detection that could save many more lives. 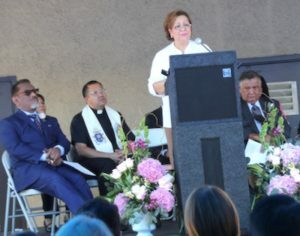 Arroyo Vista Chief Executive Officer Lorraine Estradas told the gathered crowd that legislation co-authored by Cedillo while in the assembly had resulted in a $284,000 grant to purchase the very expensive mammography and other diagnostic equipment in the clinic’s breast care and imaging center. The equipment, she said, is saving the lives of women like Olga Hernandez de Lemus, a patient whose breast cancer was discovered by a routine mammogram taken at the community clinic, and who is now nearing the end of her successful cancer treatment. AB 2875, the Cedillo [Richard]Alarcon Grant Program, authorized funding for community clinics that are often the front line and safety net in the delivery of health care services to women without health insurance. The sophisticated equipment available today at Arroyo Vista was not readily available to women without health insurance or of limited financial means, said Estradas. Arroyo Vista was the very first clinic to offer onsite mammograms, Estradas said, adding there are still only two or three community clinics in Los Angeles County that provide the important diagnostic screening to low-income women. While Ruby was not a patient of Arroyo Vista, like many of their patients she struggled to find the care and treatment she needed. 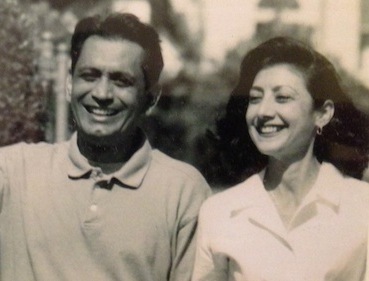 At the time she was diagnosed, the Cedillos did not have health insurance because her husband had just lost his job with the union where he’d work. The couple would scramble to get Ruby medical care, calling in favors and referrals from friends and using the services of community clinics like Arroyo Vista, according to the councilman. Ruby was full of life, an avid sports fan who loved the LA Lakers and UCLA Bruins and the Garfield High School Bulldogs, her alma mater. Passionate about issues that affect people, she involved herself in the political campaigns of people she thought could make a difference, and visited and mentored at-risk children in local juvenile facilities, according to the councilman. She led vacation bible school at the Foursquare Christian Church in Garvanza where she’d been a member for years. In the end, Ruby would lose her battle with breast cancer. The struggle of what she went through was the inspiration behind AB 2875, Cedillo said. One in 8 women will be diagnosed with breast cancer and 16% percent will lose their fight with the disease, Oye said. More women are surviving today, he said, but many more would survive if they had better access to early detection screenings like those offered at Arroyo Vista. As a group, Latinas have the lowest rate of getting mammograms, just 46%, Oye said. Poverty, no access to health insurance are a big problem, that’s why the work Arroyo Vista does is so important, said Oye, congratulating Estradas, the center’s staff and board of directors for the job they do. Since 2004, Arroyo Vista has administered 26,000 clinical breast exams and 21,000 mammograms, according to Board Chairman Roger Estrada. The center’s dedicated team provides case management and follow up with patients’ primary care providers at all five of Arroyo’s Vista Clinics. Arroyo Vista provides healthcare to patients regardless of their immigration status. Olga Hernandez de Lemus is one of the patients who can attest to the quality of care Arroyo Vista offers its patients. Lemus went to Arroyo Vista in 2015 for a check up after having fainted. During the exam, she mentioned she had not had a mammogram in more than a year and the clinic immediately arranged one for her. She soon received a call informing her that the mammogram had picked up something and more tests were needed. The tests revealed that Lemus had breast cancer. Arroyo Vista arranged for her to get a mastectomy and radiation. They kept track of her treatments and provided much needed encouragement, Lemus said, appreciative of the competent and compassionate care she receives at the community clinic. It was very hard, very painful, she said. “At times I just wanted to give up, but I told myself I could do it, I can’t give up,” she said, telling the audience that Arroyo Vista had saved her life. She said if she had any message for women it’s to get a mammogram because early dedication of breast cancer can save your life. Turning to Cedillo, tears in her eyes and her voice breaking, Lemus thanked the councilman for his part in her survival. “Without a leader like you, women would not have a center like Arroyo Vista to come to,” Lemus said. Visibly moved, Cedillo called the naming of the center for his deceased wife “bittersweet.” He said Ruby would have been very proud and while she’s not here physically, she’s always by his side as he works to bring to fruition what they wanted to do to help the working poor. Cancer can take its toll on a family, Cedillo said. It is one of the most horrifying moments in your life, he said. Cedillo closed out his remarks by surprising Arroyo Vista’s staff and board with a $25,000 check to use for its continuing care of women. He said community clinics like Arroyo Vista are vital to the communities they serve. “This money will help us provide services to many more women,” said board chair Estrada.